I wasn’t supposed to have made this cake. At midnight, I lay on my bed furious with myself that yet another attempt to make genoise sponges had transformed into three dense pancakes that were both rock hard and doughy at the same time. I was baking for a charity bake sale, the first since we moved to Glasgow and I was determined to bring in something. But eight eggs down, not a lot of icing sugar left and the hours ticking by, it didn’t seem possible. I contemplated giving up for around fifteen minutes but eventually I dragged myself up, worked out a recipe with the scraps of ingredients I had left in the kitchen, put on a podcast and started to bake. At 3am I was covered in icing sugar, tired from multiple rounds of washing up and the kitchen was covered in a light dusting of icing sugar snow. Yet I had a workable cake I could assemble in the morning. I went to bed so exhausted but happy. I don’t think I would have slept as contently if I had given up trying. This cake wasn’t about winning prizes or showing off, rather just showing up. 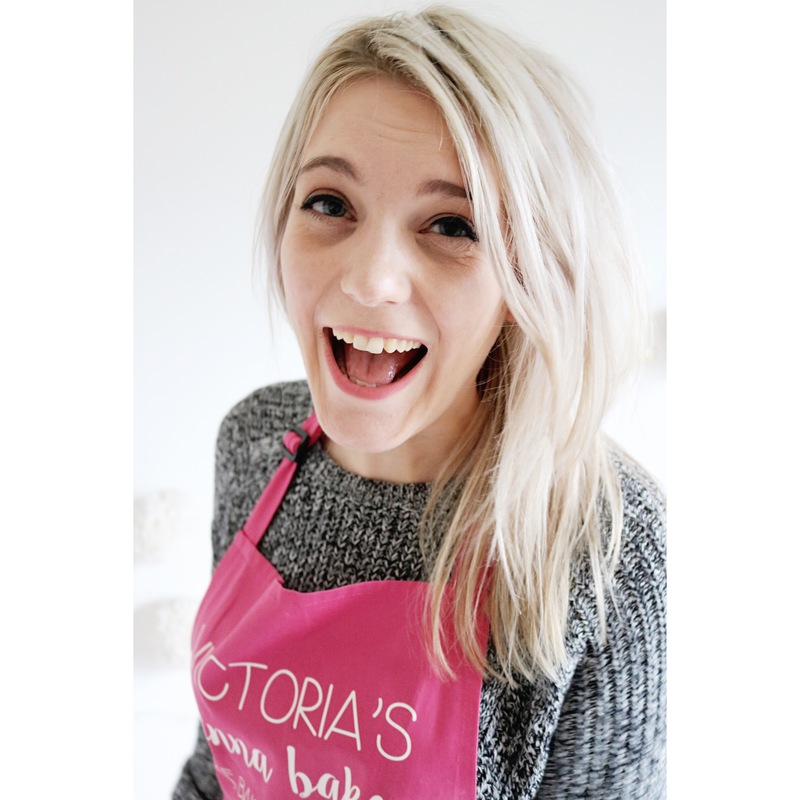 Baking is my way of saying hello, whether it’s bringing in cookies to break the ice or whipping up scones for guests. To think that I would turn up without a bashed cake box filled with sugar seemed impossible to me and while I doubt anyone else would have cared too much about there being one less cake to slice up and sell for pennies, I would have. 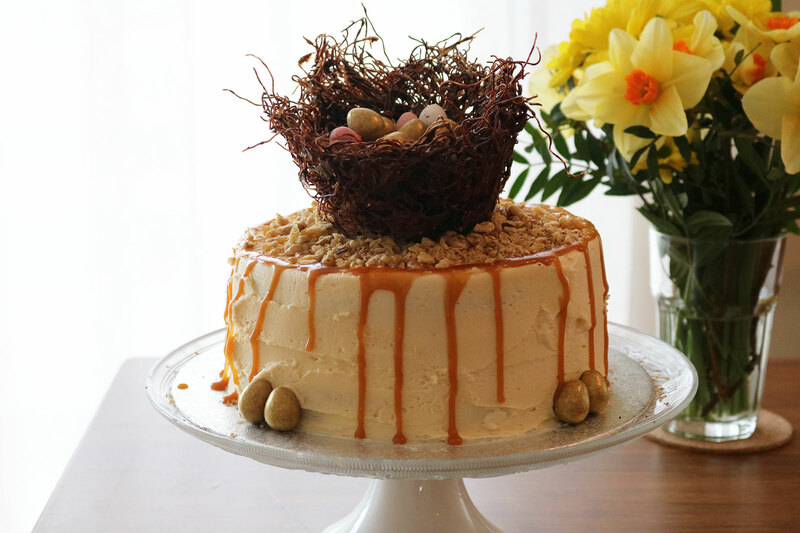 I woke early and tip toed into the kitchen, easing the chocolate nest from clingfilm and dripping salted caramel down the sides of the cake. I shot a few pictures before I tentatively walked with the cake in my hands (with assistance from C of course) and unboxed it for the table. When I stood back and saw it with the others, it made me happy that I hadn’t let my baking failures hold me back from dusting myself off and trying again. Oh, and it won second place for design which was lovely. I saw a few pictures of Pinterest of these spindly vermicelli rice noodle nests and based the design of the cake around it. Toying with the idea of pastel buttercream, i instead made a batch of caramel with a healthy helping of smoked sea salt (far nicer flavour that the regular flakes in my opinion) and stirred it through a classic buttercream with a dribble of double cream as I had some left over. 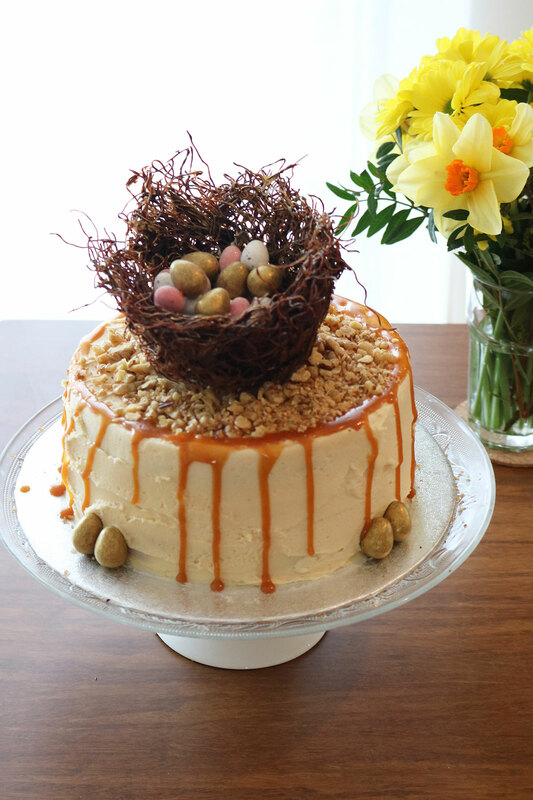 I then poured the last of the caramel into a squeezy bottle and after a few crumb coats of buttercream, carefully piped around the edges to create a drip effect. 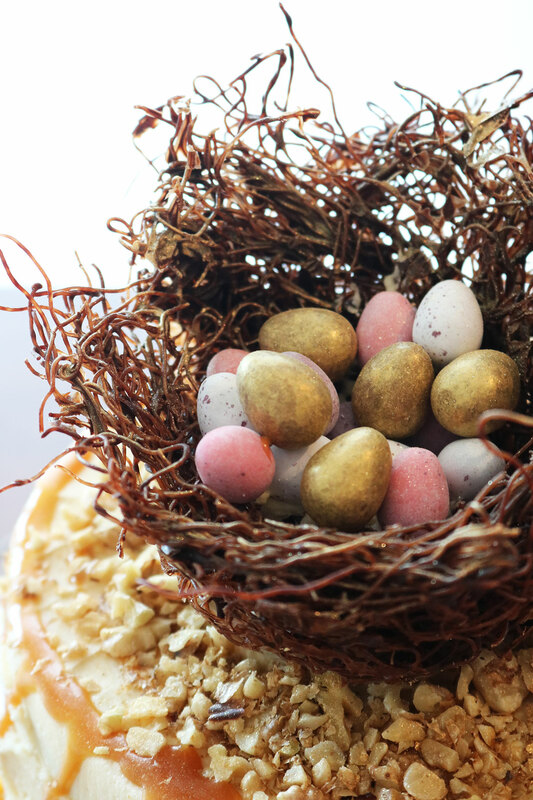 I filled the chocolate nest with a mix of Galaxy Golden Eggs and Cadbury’s Mini Eggs for a little colour, then pressed it into the cake with a good dollop of extra buttercream. Walnuts were toasted chopped and dusted with edible gold and the sides of the nest given a little brush for some shimmer. Since I made this cake so late, I didn’t take any notes for a recipe, but if you’re looking to make this yourself, I’d suggest three 20cm vanilla sponges, one batch of salted caramel, one batch of buttercream similar to this, around 70g of toasted walnuts covered with edible gold dust and this guide to making a chocolate vermicelli noodle nest. Happy Easter Monday, I’m off to finally open my chocolate egg. 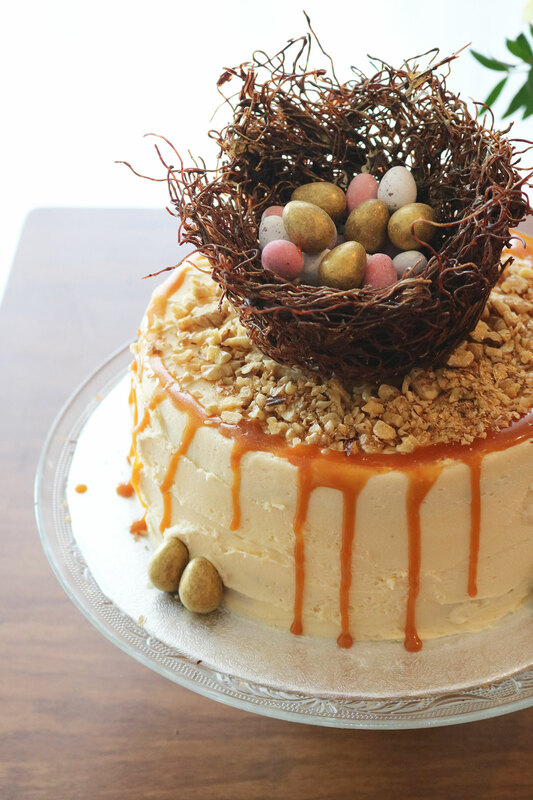 This looks so delicious with the salted caramel dripping down the side! Thanks Jen, love a good drizzle of salted caramel! ok – firstly salted caramel is my obsession!!! I haven’t made it with smoked sea salt so now I have to instantly run to my kitchen and do that. And secondly, can we be cake BFF’s – because cake is how I say hello too!!! You’re awesome and this looks delicious! LOVE LOVE LOVE the nest. Thanks Riann what a lovely comment thank you so much! I find cake is the best way to say hello to new people – who can resist a bit of sugary sweetness! Today up for being cake bffs!